SOLIDWORKS customers have been driving the evolution of SOLIDWORKS PDM since 2006, and it has all happened because of the Enhancement Requests (ERs) that customers have filed! Look how much SOLIDWORKS PDM has changed since this video from our website in 2006. As customers working in your own unique environments; you have insight into how our products could work better in your unique environment. 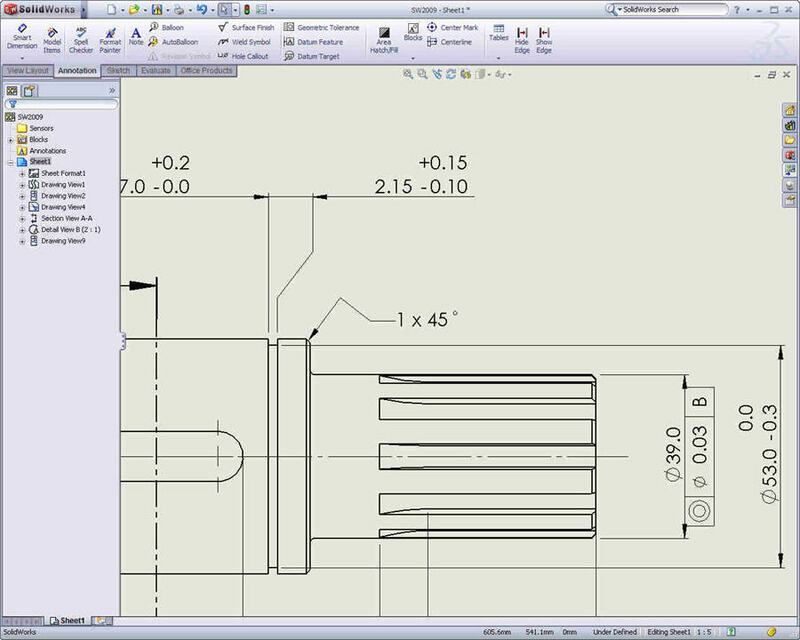 You think about how our products should work and filing ERs makes you a Development Partner of SOLIDWORKS. Those ERs frequently drive Development and become part of the SOLIDWORKS PDM product line with passing Service Pack Updates and New Releases. Records show that since March of 2006 our customers have been filing Enhancement Requests to enrich SOLIDWORKS Enterprise PDM, now known as 2 products: SOLIDWORKS PDM Professional and SOLIDWORKS PDM Standard. Please refer to our Knowledge Base (KB) Solution S-032728 for the details. First, we recommend you to search for an existing Enhancement Requests and if it closely matches your idea; VOTE for it! Yes, popularity is a weighing factor with our Product Development Team. If you do not find an ER which matches your idea you can request that a new one is created. When your ER is accepted it will be assigned an SPR (Software Performance Report) Number and will soon be listed in the Knowledge Base. The PDM Top 40 ERs to date; based on Customer Hits are listed below. Thanks for being our partners and for helping to evolve the SOLIDWORKS PDM Products as well as all of our other SOLIDWORKS Products to best suit your needs. The SOLIDWORKS® R&D team has once again been hard at work and is very excited for the start of the 2019 Beta program which will be launched in late June 2018. As we did last year, lets set the clock back 10 years and see some of the highlights of the 2009 SOLIDWORKS release. Assembly Bill of Materials – You can now create a bill of materials (BOM) directly in an assembly without first creating a drawing. SpeedPak – The new SpeedPak technology creates a simplified version of a complex assembly without losing references. SpeekPak uses a subset of the parts or faces of an assembly, which reduces opening time, saves memory, and improves the performance of many operations. Dimension Jog – You can now jog an extension line. Drawing Sheet Quick View – You can now get a preview of a drawing before you open it. Quick view is a read-only mode that provides a simplified drawing representation. 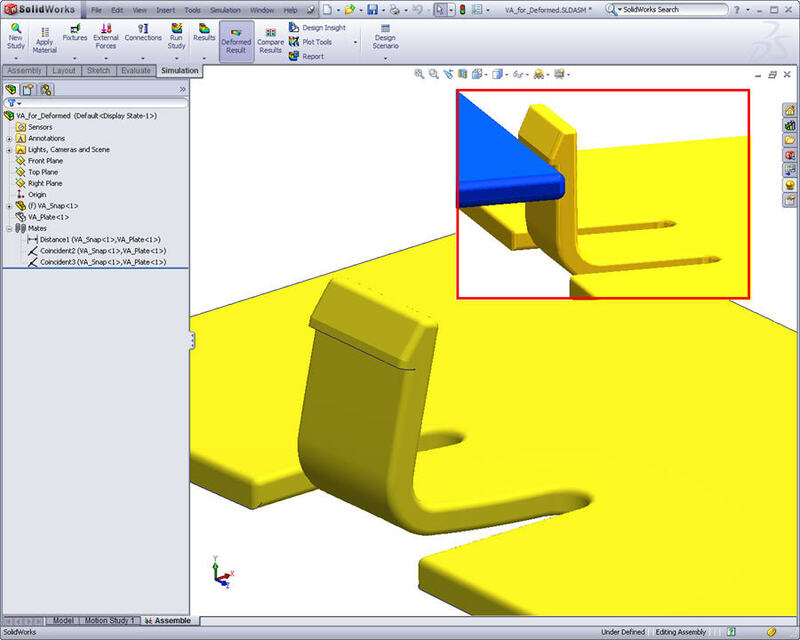 Convert to Sheet Metal – You can now generate a sheet metal part from a solid part. 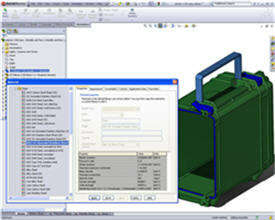 Unified Materials Database and User Interface – SolidWorks and SolidWorks Simulation now share the same user interface for materials and share the same materials, including their physical properties, default crosshatching, and appearances. Custom materials you create are available for both design and simulation. 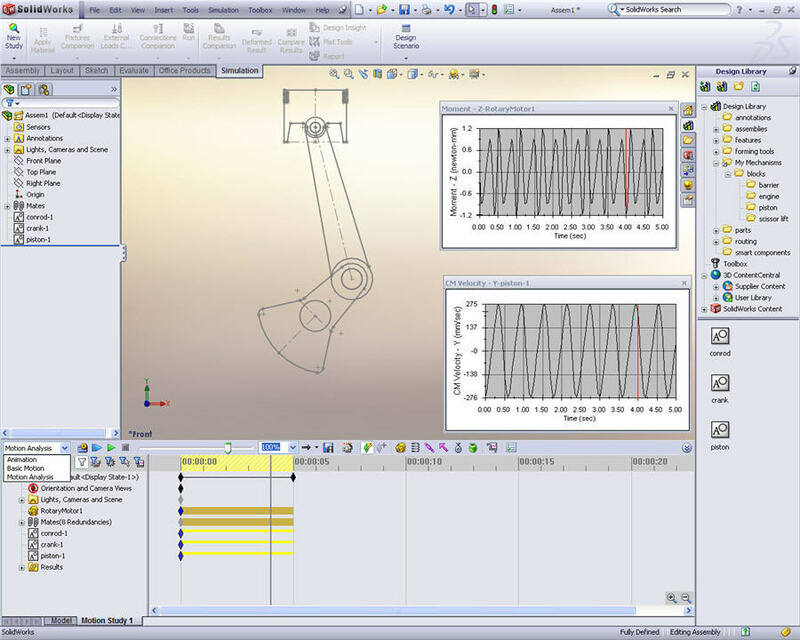 Mates for Simulation – You can now build design intent into SolidWorks mates to automate Simulation setup and part-to-part interactions across all studies in a model. You can define contact, shrink-fit, and bonding once, at the mate level. Meshes for Thermal Temperature Studies – Interaction of thermal studies with static and nonlinear studies now accommodates dissimilar meshes. Temperatures from a thermal study with certain mesh properties are interpolated seamlessly to a static or nonlinear study with different mesh properties. Deformed SolidWorks Parts from Results – You can now save the deformed state of an assembly as a new multibody part document or as a new configuration. 2D Mechanisms in Layout Sketches – You can now run animation and Motion Analysis studies for layout sketch mechanisms you create from sketch blocks. You can simulate the basic operation of 2D mechanisms in layout sketches before committing time to a detailed design. Support for Lightweight Mode – You can run motion studies for an assembly in lightweight mode without first resolving it. Multi-processor Support – Flow solutions are iterative and can take a few hours to complete. 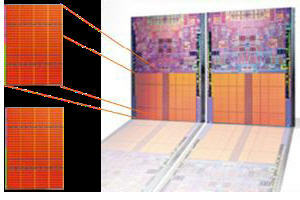 Multi-core and multi-processor support enable Flow Simulation to run 1.3 to 1.5 times faster than in previous releases. Radiation and Non-Newtonian Models – You can now include bodies transparent to solar radiation. You can also test data on non-Newtonian fluids. If you liked that time travel session, check out the May 2014, June 2014, May 2015 and June 2017 editions of the SOLIDWORKS Support Monthly News for a reminder of the best enhancements in versions 2004, 2005 2001 and 2008 respectively. No sign up is required. 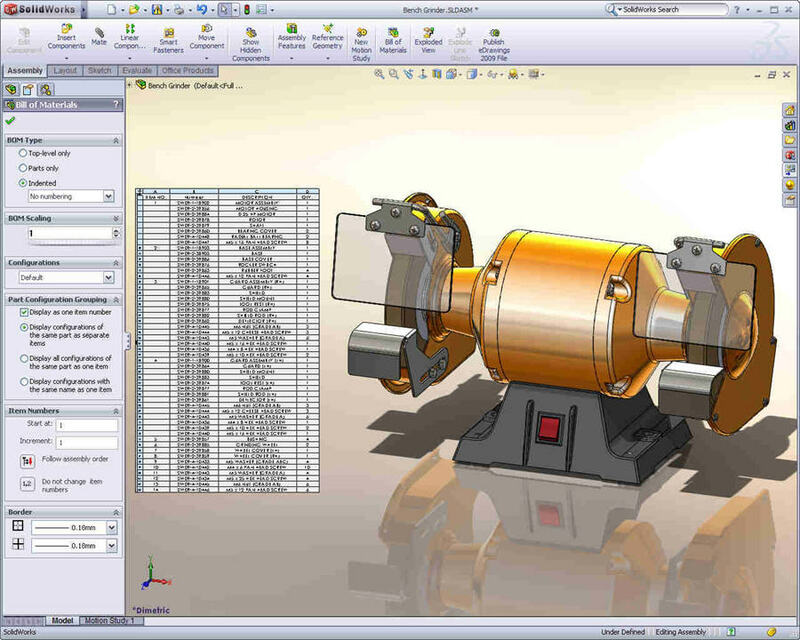 Access to the Beta software is automatically available to SOLIDWORKS® subscription service customers. If you are currently on subscription and your SOLIDWORKS serial number is registered in your SOLIDWORKS Customer Portal account, then the Beta software will be available to download from the SOLIDWORKS Beta website during the beta period (late June to mid-September). When I install SOLIDWORKS®, why do I see the error ‘The Windows Installer for this product component did not run as expected: register_i386_SldShellExtServerExe’? This behavior is possible if one or more of the prerequisite Microsoft® Visual C++ Redistributable dlls are missing. In some instances, the issue was resolved by reinstalling the Microsoft Visual C++ 2015 Redistributable software. For more information and the steps to resolve this issue, see Solution Id: S-074483. When routing in SOLIDWORKS® Electrical 3D, what determines the performance time? Performance when routing relies on more than the number of wires or cables in a route. For more information, see Solution Id: S-074356. When performing a content search in SOLIDWORKS® PDM, what could cause the error: ‘Could not access the item in the database.’? To resolve this issue, follow the steps in Solution Id: S-074365. In the SOLIDWORKS® software, how do I import as a mesh object the STL file from a Smoothed Mesh Export of a SOLIDWORKS® Simulation Topology study? In SOLIDWORKS® Flow Simulation, is it possible to use the ‘Free Surface’ feature to simulate capillarity? Capillarity (also known as capillary action) is the ability of a liquid to flow in narrow spaces without the assistance of external forces like gravity, pressure gradients, etc. This motion occurs because of intermolecular forces between the liquid and surrounding solid surfaces. For more information, see Solution Id: S-074512.